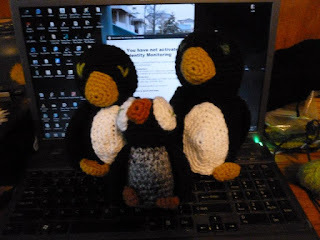 I had some lofty goals about making more of my presents this year, but there are only so many hats my family members need and the stuffed toys, while adorable, aren't on most adults' Christmas lists. . .Fortunately, I have a niece young enough to appreciate toy animals, and for her I made this marching penguin family. The baby is a larger version of this pattern, if you'd like to try and give it a go. The parents are another original pattern which I have yet to write down (sort of like my panda bear or fish; I have a lot of pattern writing to do.). I'm hoping that they'll be lots of fun to play with. . .I know Coryn has already been begging for her own set. Check out my shop, Critters for Coryn. 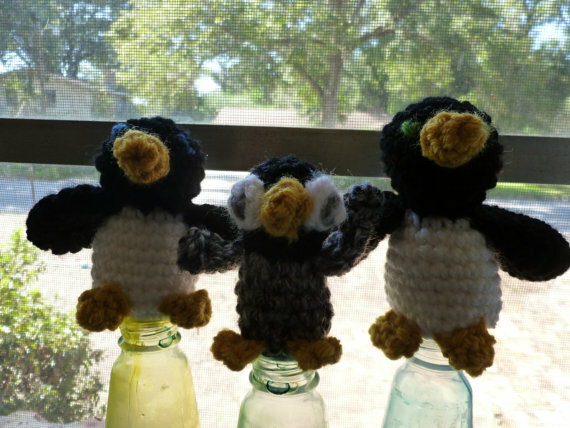 Your little penguins and other crochet items are so cute! Good luck with your etsy shop! These are really cute Heidi! You need to come link up on my Homemade Christmas post. I will definitely go check it out. Thanks for dropping by. Yay! You were the first linkup! !